Pean was born at Loch Arkaig in Lochaber and hadn't been seen since migrating in 2017. A Scottish osprey has died after being electrocuted on power lines in Spain. Pean was fledged from a nest on Loch Arkaig in Lochaber in 2017. Ringed as blue JH3, he was named Pean after the burn running into the loch near the nest. He migrated south before being spotted again in October 2018 by Spanish birdwatchers at the Marjal Pego-Oliva Nature Reserve between Alicante and Valencia. 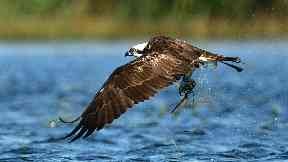 Becoming something of a celebrity, he was even poster-boy in publicity for an osprey census in the area. However, Pean was electrocuted on a power line just after Christmas, it has now emerged. Itziar Colodro, of the Magic and Nature Birdwatching Company, said: "I am very affected by the news. I was tracking JH3 in the Marjal de Pego-Oliva Natural Park. "We will have the memory of the big fish that he caught. He was a crack fisherman. "JH3 has given us the best photographs ever taken before in our area. We will miss him so much." Mr Colodro campaigns for improvements to faulty power lines that pose a threat to birdlife in the area. Worn areas of insulation can give birds a lethal shock if they perch upon them. Pean's electrocution caused a power cut in the area and his body was found by engineers called out to deal with the outage. The incident took place on agricultural land used to grow rice, just outside the nature reserve.